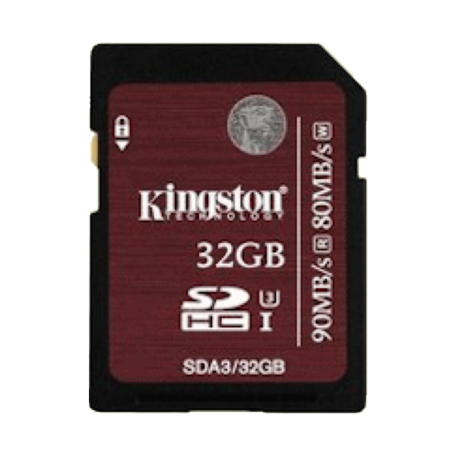 Kingston SDA3/32GB SDHC kaart kopen? | That's IT! Move to faster performance with Kingston’s SDHC/SDXC UHS-I U3 Flash card. With speeds of 90MB/s read and 80MB/s write, it reads up to 9x faster and writes up to 8x faster than standard Class 10 SD cards. It meets the SD Association’s latest specification release, UHS-I U3 (Ultra High-Speed Bus, Speed Class 3), which guarantees performance of at least 30MB/s and enough bandwidth to record and playback 4K2K video without interruption. Users can capture cinema-quality Full HD (1080p), Ultra HD (2160p), 3D and 4K2K videos on high-performance cameras such as Digital Single Lens Reflex (D-SLR), Digital Single Lens Mirrorless (D-SLM), camcorders and video cameras. It’s ideal for television recordings as well as live broadcasts, plus it lets you edit files faster and provides faster upload times, especially when using USB 3.0 card readers. Its higher sustained write speeds ensure video integrity by reducing stutter and allow photographers to shoot in continuous burst mode. Available in 16GB, 32GB, 64GB, 128GB and 256GB capacities, SDHC/SDXC UHS-I U3 lets users record more video without changing cards and lets photographers shoot high-density image files, such as RAW or JPEG, without running out of space. SDHC/SDXC UHS-I U3 is backed by a lifetime warranty, free technical support and legendary Kingston® reliability.